Jake Elder is a member of the Bloomberg Associates (BA) Sustainability Practice, where he advises mayors and senior city officials on sustainability initiatives and translates policy into on-the-ground change. In his work, he helps cities leverage data analysis and stakeholder engagement to navigate the transition to clean energy, reduce greenhouse gas emissions, and mitigate the impacts of climate change. For example, Jake worked with Oakland, California to develop a data-driven pathway to achieve deep reductions in greenhouse gas emissions. In the U.S. Virgin Islands, he is directing the development of a plan to rebuild the territory’s energy grid with more sustainable and storm-resilient infrastructure. Jake also currently leads engagements in Nashville, Tennessee and Athens, Greece. 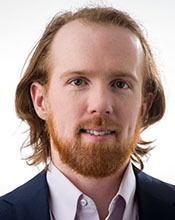 Jake has developed deep expertise in global public policy development and implementation, having advised over 50 public sector clients in Europe, North America and Latin America. Before he joined BA, Jake was a member of Accenture’s Public Service Strategy Practice, where he worked with organizational leaders of state and local governments, higher education institutions and non-profit organizations. He also conducted market research for one of the first venture capital funds to utilize a low carbon investment strategy. Jake grew up on the North Shore of Massachusetts, where he developed a love of nature that drives his passion for sustainability. He graduated from Trinity College (CT) with a B.S. in Economics and a minor in Models and Data. He also holds a Certificate in Business Strategy from INSEAD.